You may estimate the following if necessary; however, numbers on the Completion Report must be accurate. Has the Event been funded with a Tourism Grant before? Are you receiving other grants, scholarships, donations, or outside funding? How will the Tourism Grant be used? In the spirit of this grant, how will proceeds, if any, from this event be used? If you receive a Tourism Grant, to what email address do we send the CVB logo for use in promotional materials? Please list all revenue sources with dollar amounts. Click the PLUS sign on the right to add as many line items as needed. Please list all expenses with dollar amounts. Click the PLUS sign on the right to add as many line items as needed. Grant recipient shall defend, indemnify, and hold harmless the Emporia Convention and Visitors Bureau, The Emporia Area Chamber of Commerce, their officers and employees from any claims, damages, liabilities, losses, government process, costs, expenses, including attorney's fees and costs of suit,arising out of any misrepresentation misappropriation of intellectual property, violation of privacy rights, and any injury to persons or property arising out of the event. 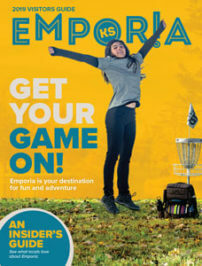 The Emporia Area Chamber of Commerce and Convention & Visitors Bureau is relying upon the even organizer to make all necessary arrangements for security and safety at the event, and is not responsible to the event organizer or to any third parties for their safety.